While recent scholarship has expanded our understanding of the Cold War by including the narratives of imperialism, decolonization, and Third World nationalism, the Left continues to be synonymous with Soviet socialism. The Leninist-Stalinist model of one-party rule, authoritarian male leadership, state-sponsored development, and an obedient citizenry has subsumed the alternative genealogies and political visions within the global left. 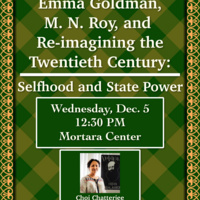 In this talk, Professor Chatterjee will analyze Emma Goldman and M. N. Roy’s understanding of the dialectic of state power and selfhood. Goldman and Roy, risking ostracism and oblivion, developed an anarchist and humanist critique of liberal capitalism and state socialism that is well worth re-considering today. Co-sponsored by Georgetown History, the Mortara Center for Interational Studies, and the Georgetown India Initiative.